Lady Palm is a dramatic, tall house plant that is easy to grow. Give one a place with bright, indirect sunlight and you'll enjoy it for many years. You can fit this palm in just about anywhere -- its fronds don't branch out widely, so it only takes up vertical space in a room. Fronds grow in a fan pattern, each consisting of deeply veined leaflets that grow up to 12 inches (30 cm) long and 1 inch (2.5 cm) wide. You'll find that the number of leaflets on each stem will vary -- typically 5 to 10 -- but that just adds to this beautiful palm's appeal. In fact, I've never seen two Lady Palms exactly alike. A member of the palm family, this elegant-looking plant grows in a clump of woody, upright stems. As the lower leaves fall off, they leave scars on the stems, creating an attractive bamboo-like appearance. Repot in spring only every 3-4 years, or when this palm outgrows its container. 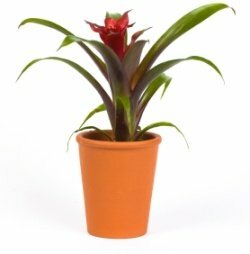 This plant grows best when slightly root-bound, so keep it in a smallish container. 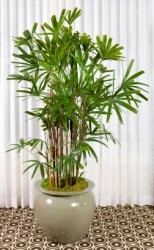 Keeping Lady Palm confined to a small container will also dramatically limit its size. In fact, it can be grown in a bonsai pot. When the tree grows to more than 3 ft (90 cm) tall, top dress instead. How to top-dress a plant: Remove the top 2-3 inches of soil and replace with fresh soil every couple years. Take care not to harm any roots that may be near the surface. Keep it moist. Palms are not desert plants. Aim to keep the soil evenly moist, but not soggy, during the growing season. Mist the foliage daily or use a room humidifier if the air is dry. Brown leaf tips are caused by irregular watering and dry air. Snip off the brown tips with scissors, if you want. This palm's problems are few, although dry air may attract spider mites to its leaves. Wiping off leaves with a damp cloth from time to time will do double-duty, removing dust and keeping those pests away. 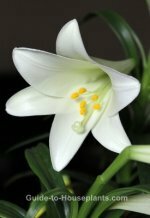 You can breathe easier, knowing this is one of the best plants for improving air quality indoors. It has one of the top removal rates of toxins such as formaldehyde and ammonia. This is a slow-growing palm so buy one the size you want. More than 100 named cultivars are available, most with Asian names. 'Koban' is a popular cultivar with dark-green leaves. 'Zuikonishki' has green leaflets with white stripes...'Gyokuho' is a dwarf variety, as is 'Kodaruma', the smallest of all, reaching only a few inches high. Height: Up to 10 ft (3 m) outdoors. It stays smaller when grown in a container. In fact, it can be grown as a bonsai plant, reaching only 12 in (30 cm) high. Light: Bright, indirect light. Too much sun will cause the leaves to turn yellow-green. Water: Keep soil evenly moist in spring and summer. In winter, allow the top 1 in (2.5 cm) to dry out between waterings. Like other palms, it is sensitive to fluoride and other chemicals in tap water, causing leaf tips to turn brown. Humidity: Moderate to high humidity. Brown leaf tips may indicate that humidity is low. Mist foliage and stand the pot on a tray of wet pebbles. Fertilizer: Feed monthly in summer with a balanced liquid fertilizer diluted by half, or a light sprinkling of time-released house plant fertilizer.